Unless you've been living under a rock these past few months, the issue of Blackfriars Bridge can't have escaped your attention. Thousands have signed petitions, added their photos to a picture wall, and demonstrated on the bridge itself to tell Transport for London that their designs and plans for the bridge are dangerous, outdated and just down right wrong. But unelected and unaccountable Transport for London are going ahead anyway. Currently, cyclists are the majority of traffic on the bridge at busiest times. When the new Blackfriars Station opens the streets will be full of many thousands of pedestrians every hour. The bridge should become primarily a place for people; where people on foot and people on bikes feel comfortable going about their journeys. But instead it will be a space designed solely to squeeze through as many cars as quickly as possible. First, cyclists forced Transport for London to open the entire scheme to a proper public consultation and many hundreds of you wrote in. Then, cyclists were successful in stopping TfL's plans to rip out the cycle lanes at the north end of the bridge completely. But the remaining plans were still terrible; increased road danger, increased traffic speeds and capacity, and increased air pollution hardly make a "cycling city". 100s took to the bridge in protest in May, buying more time. People continued to write, to lobby, to petition and campaign. We contacted our MPs and our Assembly Members. We got a unanimous motion carried at the London Assembly. There were radio interviews, and television coverage. Ordinary Londoners - not even cyclists - started to see that Blackfriars should be a people-led place. On the second flashride - organised in just a few short days - 1000s of people took to the bridge as the building crews and diggers moved in. Things go quiet in London over the summer; politicians take their breaks, building work slows down. The powers that be at TfL have been sitting in their ivory towers at Palestra and hoping that the "Blackfriars" issue will blow over and go quietly away. But it won't, and we need your help to ensure it stays top of the agenda. We've already achieved so much; forcing TfL to open up to having our voices heard, and making sure the cycle lanes stayed. But we can do so much more; ensuring that the 20mph speed limit is kept on what will be a primarily walking and cycling space, ensuring that space for motorised traffic is not enlarged, to ensure decent quality cycling infrastructure can be installed. Making sure no more people die on the bridge because of the block-headed fantasy of a second rate urban planner. First the speed limit must be maintained, secondly the designers must go back to the drawing board to create a place worthy of a true cycling city; where you don't have to be a fit young man on a road bike to safely ride here. What happens at Blackfriars is important to London, and to all Londoners. It is the pursuit here of "smoothing the traffic flow" by TfL which is bringing about these terrible changes. It is the pursuit of the same agenda elsewhere in London which proposes running the new cycle superhighway down the middle of two lanes of fast moving traffic on Vauxhall Bridge, to rip out cycle lanes at London Bridge, it is why the good people of Elephant and Castle are being denied escalators and a new pedestrian plaza outside their train station, why a cyclist-killing junction in Camden hasn't been re-designed, it's why Oxford Street, and Parliament Square, aren't the pedestrian paradises they should be, it's why cycle "superhighways" disappear beneath parked cars, and why children don't dare cross the road at Henly Corner for fear of being mown down by lanes and lanes of traffic. It's why, on Wednesday 12th October at 5.45PM I'm going back to Blackfriars Bridge again for Flashride 3, and it's why I'd like you to join me. Tell your friends, bring your family, enlist your colleagues. 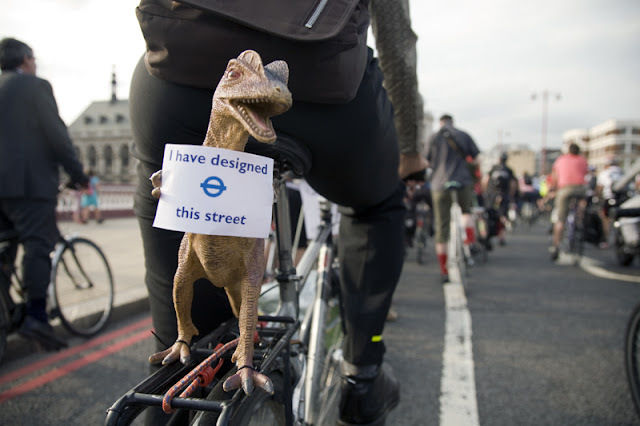 When all other democratic options have been exhausted it is going to take the biggest walking and cycling demonstration London has ever seen to tell Transport for London once and for all that they have got their plans wrong on Blackfriars Bridge. It comes down to this; do we want to build a city in which we and our children can move safely about in the most sustainable ways, or do we want to build more streets fraught with pollution, road danger and traffic? Many hundreds have already pledged to attend the flashride on the London Cycling Campaign's website; I'll be there too, will you? I will be there too. So that my kids won't have to face multi lane roundabouts on their way to school. I think it's very important to show the powers that be that we are having none of it. I totally agree with you @Ndru Enough is enough indeed! I think you are on to a loser here. The real problem with London is that far too many people are crammed into a small space, many of them doing jobs which can be done anywhere, especially in these days of electronic communication. Until a few of London's mundane millions move somehwere less crowded leaving a city populated only by the nation's movers and shakers and the people needed to feed, water and entertain them - plus tourists, then it is always going to be a terrible place for cylists. Central government could lead the way on this. At least 80% of central London civil service jobs needn't be in the capital at all. @Pete thanks for stopping by and sharing your thoughts. So the problem is actually with Transport for London's intention to squeeze as many cars as possible through the northern junction, despite there being many many times more pedestrians and cyclists. That is to say, the most inefficient (and dangerous, dirty etc etc) way of moving people through the space is being prioritized above more sustainable (and more vulnerable) options. And the people on bikes aren't just any old yoghurt-knitting harpies; they're bankers, traders, clerks, designers, nurses and teachers. The sort of people the City relies on being able to get from A to B efficiently. So rather than being a losing situation, it is, in fact, imperative that TfL are shown to see sense on this issue. I never suggested social engineering, but the fact remains that while so many millions of people choose to live and work in such a confined space then cycling will not be pleasant. As for cities being densely populated for thousands of years- yes I suppose they were, but for most of that time they were very small, with alleys rather than streets and would have been cycling unfriendly had bikes been around. And a bike would have been unnecessary anyway. For example, you can walk right across mediaeval York's area in 10 minutes or so. It seems that the government is to blame for much of the congestion in central London, employing far more people than is needed in the area than is really necessary, even for a capital city. I know. I've worked for the government in central London, and there were hundreds of us in just one office who could have been anywhere in the UK. Our personal proximity to the Houses of Parliament and Whitehall was utterly irrelevant. The government is quite happy to embark on all sorts of social engineering through laws and taxation. When it comes to crowding on London's streets moving governmen jobs outside the capital seems an obvious thing to do. It wouldn't solve the problem, but it'd help - and a lot more than London's miserable cycle lanes and other council cycling facilities. If we are to accept that millions are free to cram themselves unnecessarily into the London area, then we also have to accept that most people are never going to be cyclists in London just as they aren't anywhere else. And London cyclists should accept that they are always going to suffer for choosing to live and/or work in such a densely popualted area. I moved out of London, and my life is much better for it, and I enjoy my cycling much more too, including commuting. London is a great place to visit though. It sounds like you have a very strong anti-city, anti-high density view. On its own, it has merit, but it has little to do with conditions being poor for cyclists. High density population centres can only function if people choose to get around by means which are economical with space ie; each person not travelling alone in a 5-person vehicle which actively degrades the vicinity in so many ways for everyone else. Walking, cycling and mass transit systems allow high density urban centres (and the advantages they bring) to exist and function smoothly. What TfL are doing here is breaking the system which allows high density cities like London to work. By prioritising motor traffic above pedestrians and cyclists, they throw-away the most precious resource London has; space. By catering for cyclists and pedestrians, whilst making it too much of a hassle to drive in London (or any city), planners can help make high-density urban centres function, and function well. What TfL have done, is show that they have no understanding of the transport needs of a dense, modern city like London and with no real accountability, the only real option is for Londoners to take to the streets and show them that they don't want a transport network which makes sense for a city as large and dense as London. @Pete Netherlands are the most densely populated country in Europe, with their cities being equally densely populated, yet the conditions for cycling are fantastic. While we can't tell people to sod off to wherever (an relocating a few offices will do nought for the population density, plus nature hates void - space will be filled by something else), we can definitely dedicate more exclusive space to a mode of transport that uses up the space in a much more economical way. It's about balance - giving people who want to use bicycle as a mode of transport a safe way of doing so. hi, i am thinking of joining critical mass, but i am a little confused about the requirements. It seems to me that the whole idea of CM is to protest against the pollution caused by vehicles, and to reclaim the streets for themselves? If that is the case, and i do join, does that mean that i have to change my whole way of life, and my whole lifestyle, to avoid being labelled a hypocrite? Of course, i could go on and list hundreds more examples of everyday things that we ALL rely on ROADS and vehicles for. It seems to me that CM are only interested in protesting against people who are using cars when it is CONVENIENT for CM members to protest (i.e. when they are not personally, yet indirectly, benefitting from the road system!) Not when they go into the newsagent in the morning to pick up their newspaper (delivered by a van, or lorry driver, of course!) If CM members were to completely and TOTALLY change their WHOLE lifestyles so that they didnt rely on the road systems AT ALL, then i would understand their point of view. But no, ive yet to meet any of them who have done that! They all have their jolly cycle ride, inconveniencing people who just happen to be using the road system at that moment in time, and then where do most of them go? Down the pub to drink the drink that was lorried in by ROAD! If you truly want to get rid off all cars and lorries etc that use the roads, then you have to go right back to basics. The fact is that there are too many people being born these days, and the only way to service all of those people is with the use of a road strutcture and transportation. For example, how would you get your disabled mother to hospital for a life-saving op? Chuck her on the back of your bike? Its rediculous. Only when the world cuts back big time on the amount of people being born, and therefore needing to be looked after and catered for, can we ever seriously consider getting rid of cars, lorries, trucks etc. Until then, please do everybody a favor and stop holding everybody up only when it personally suits you, cos its extremely hypocritical. and just to add... could all you cyclists PLEASE put on a hig vis yellow jacket AND good quality lights? Those of you who think is is acceptable to wear dark clothes at night, and have no lights on, are complete ACCIDENTS WAITING TO HAPPEN. As a car driver, i CANNOT. SEE. YOU. if you insist on wearing DARK CLOTHES, and no high res jacket, and no lights (and worse till, put ear phones in your ears), I. AS A DRIVER. CANNOT. SEE. YOU. So, dont go blaming the driver when you end up being squashed like a lemon beneath some truck.